Thordon Bearings presented its environmentally safe and long-life RiverTough tailshaft bearings and TG100 shaft seals, which were developed specially for workboats, at the International Workboat Show, which took place in New Orleans, USA, in November/December last year. The water-lubricated bearing pioneer exhibited its RiverTough tailshaft bearings and TG100 shaft seal, both of which are capable of meeting the tough operating conditions workboats encounter in river and coastal waters. 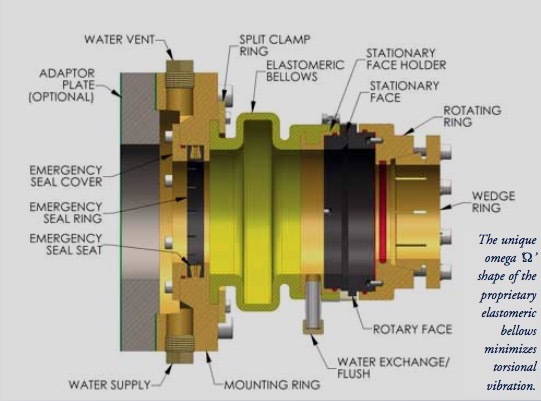 “Our RiverTough water-lubricated tail- shaft bearing system is proven to deliver exceptional performance in abrasive waters, such as those with a high content of sand,” said Thordon Bearings Business Development Manager Scott Groves. Taking stock. RiverTough Bearings prior to delivery. Referring to Inland Barge Service’s push boat Ramona, which has been operating with RiverTough since 2007, Groves said: “After nine years of operation in the harsh, abrasive waters of Alaska’s Yukon River, Ramona’s RiverTough water-lubricated tailshaft bearing emerged completely free of wear and tear. Groves said that Thordon Bearings also has data from workboats operating on the Mississippi showing typical RiverTough bearing wear rates of 0.075mm to 0.100mm (0.003” to 0.004”) in 6,000 to 7,000 hours of annual use. “This provides clear evidence of RiverTough’s superior wear life in very abrasive water conditions. They routinely outlast rubber bearings by a factor of two or more,” he said. Thordon showcased its TG100 Shaft Seal at the International Workboat Show. Since its market introduction, Thordon Bearings has supplied more than 180 TG100 seals to operators of a wide range of vessels, including workboats, naval patrol vessels, ferries, yachts, tugs and tow boats. A unique feature of the TG100 is the emergency seal that permits stand-alone operation to allow the vessel to safely return to the nearest port, preventing permanent seal damage. The unique omega ‘Ω’ shape of the proprietary elastomeric bellows minimizes torsional vibration and maintains the required spring force throughout the allowable range of axial shaft movement. This elastomeric bellows has no shelf life and no scheduled replacement. “While the TG100 seal is effective as a stand-alone installation, the optimum solution is in combination with our water-lubricated RiverTough tailshaft bearings, which have now been installed to more than 400 vessels,” said Groves. A global leader in polymer bearing technologies systems with over 35 years’ experience in this technology,Thordon Bearings designs and manufactures a complete range of non-metallic sleeve bearing solutions for marine, clean power generation, pump, offshore oil, and other industrial markets. The polymer bearings operate pollution-free without oil or grease. Thordon Bearings is the only manufacturer of propeller shaft bearings to guarantee its award-winning COMPAC seawater lubricated propeller shaft system for a 15-year wear life.